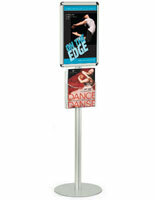 This display sign stand is made with high quality satin etched anodized aluminum. The silver finish provides a neutral tone that will complement any commercial environment. 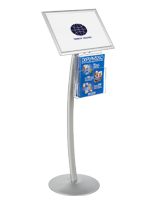 This display sign stand includes an 8-1/2" x 11" snap-open picture frame and an acrylic literature pocket. 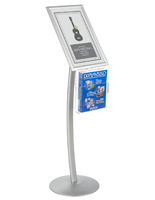 This display sign stand is often used for marketing promotional materials in retail stores, car dealerships or for directory messages in hotels or lobbies. 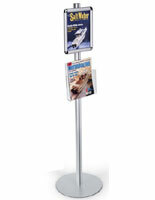 The large acrylic pocket can accommodate standard sized magazines or two brochures side-by-side. 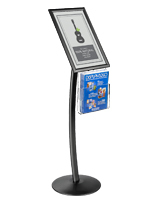 In addition, this display sign stand can be used to advertise menus at restaurants. 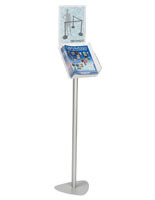 Place this floorstanding signage holder in a lobby or entryway to promote new products or services. 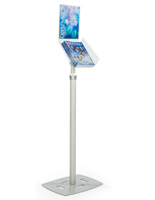 This display sign stand utilizes a snap open and close frame. 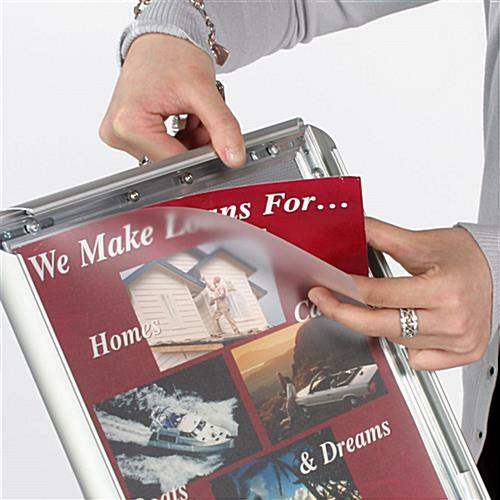 This quick clip frame is designed for fast and easy change-outs of your graphic advertisements. 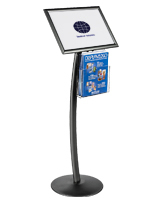 To use this display sign stand; snap open all four sides and place your graphics behind the clear, protective lens. This print frame contains a non-glare PVC sign lens to protect the graphics from any dirt, scratches and tampering. 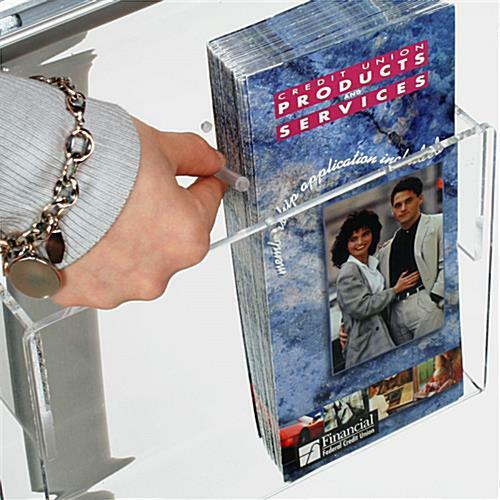 This display sign stand includes a polished acrylic literature pocket, which is suitable for dispensing free "take-one" brochures to consumers. The literature pocket holds two 4" wide tri-fold brochures side by side; or can be re-configured to hold 8-1/2" wide catalogs by simply removing the center peg divider. This display sign stand ships unassembled, but can easily be put together by one person in 10 minutes or less. 14.0" x 48.3" x 20.0"
Works great for displaying our sales flyers! Thanks so much for sharing, Benson's Pet Center. We're glad that this sign stand is working great for displaying your flyers, and we hope you'll continue to turn to Displays2go for your business's display needs. The stand came in two packages with easy-to-follow assembly instructions. I was able to set it up on-location using only a Phillips screwdriver. The classy look of the stand compliments my product at the trade show for which it was purchased. DekTek, your trade show exhibit looks absolutely amazing, and you're definitely right — our sign stand really compliments your product while making print marketing materials readily available to visitors. We're glad that you found the stand to be attractive and easy-to-assemble. Thank you so much for sharing this and writing an excellent review. We hope you'll continue to turn to Displays2go for your trade show needs! We're so happy to hear that you like your sign stand, Susan! We'll go ahead and have a customer care specialist reach out to see if we can assist with the plastic piece. Thanks for the great review! I got the sign and put it all together and notice we did not receive the acrylic sign holder 8.5x11 like the description and photo show. I love the sign itself but need the acrylic holder to complete it and at that point I would consider this a 5 star product. I'm hoping to hear back from someone to get this resolved soon. We're very sorry to hear that you did not receive your full order, Steve. A customer care specialist will be reaching out to assist you. Thank you for letting us know. Relatively easy to assemble - best to have 2 people just for the base into the long arm. Would be great if it came with a clear plastic sheet to cover the document that goes in the 8.5 x 11. Thanks for the thoughtful feedback, Kassandra! We're glad you're overall satisfied with this stand.